The Schei Gate dates back to the early 19th century and was built when the Catherine's Gate couldn’t handle the growing traffic of the city. 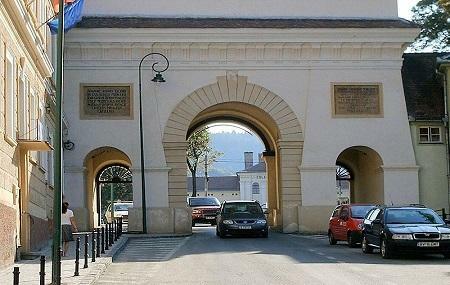 You can find Latin inscription on the gate dedicated to Habsburg Emperor of Francis I who visited the city in 1817. Today, it’s simple yet sturdy design makes it a special find- adding to the pockets of history that are now merged into the urban Brasov. The gate has two smaller opening for pedestrian traffic and a central archway for road traffic. Although not much to see, it is worth a quick pit stop during your travel around the city. An historic city gate from the 19th century. There are many things to see on either side.